Three generations of Myers’ is what has been brought to the area for over 48 years. What started out as a father/son relationship evolved into a husband/wife partnership and is currently a mother/daughter commitment. 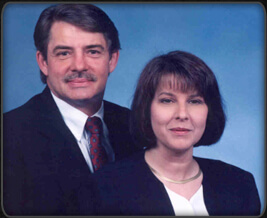 Since the death of Kent’s father, Howard, in 1982, Jane began helping with all aspects of the funeral home business. When Kent passed away on August 26, 2006, a difficult decision had to be made as to whether to keep the family business in the communities. With the support of family and friends, Jane decided to continue to own and operate the funeral home with her oldest daughter, Jill. Jill graduated from Central Methodist College in 2001 with her Bachelor of Science Degree in Business Administration and Bachelor of Science Degree in Nursing. On August 27, 2005, when Jill’s father was diagnosed with cancer, she moved back home to be with her parents and manage her dad’s treatment plans. In that time period, she served a year apprenticeship under her father and became a licensed funeral director in 2006. Jill is also a licensed realtor and is licensed to sell life, health, property and casualty insurance. Jane and Jill, mother and daughter, are very committed to the families they serve and will do what it takes to ease some of the burden that a family faces in such a difficult time.